On 25th October footage emerged from sources within Syria showing what is claimed to be a chemical weapon attack on the town of Al-Lataminah in Hama province. This article will use open source techniques to examine the footage and establish its veracity. Several videos have emerged of the alleged attack and we will examine them individually. It is approximately 2.5 times heavier than air, resulting in it sinking, rather than rising, in a normal environment. This means it will naturally flow to low-lying areas. Its gaseous colour is yellowish, although it becomes more green at high concentrations. This video shows these properties, as well as a chlorine gas test. Note how the gas remains close to the ground. We would encourage our readers to examine the videos we have linked to, as well as the stills in this article, in order to observe the “sinking” effect some of them display. Video 1, filmed by Mahmoud al-Hamwi shows a munition falling from a helicopter. It then pans round to show a splash caused by the impact. The splash is not large, and it does appear as if the smoke produced remains low to the ground. However, due to the background of the video, it is difficult to assess its colour, as well as the way it dissipates. 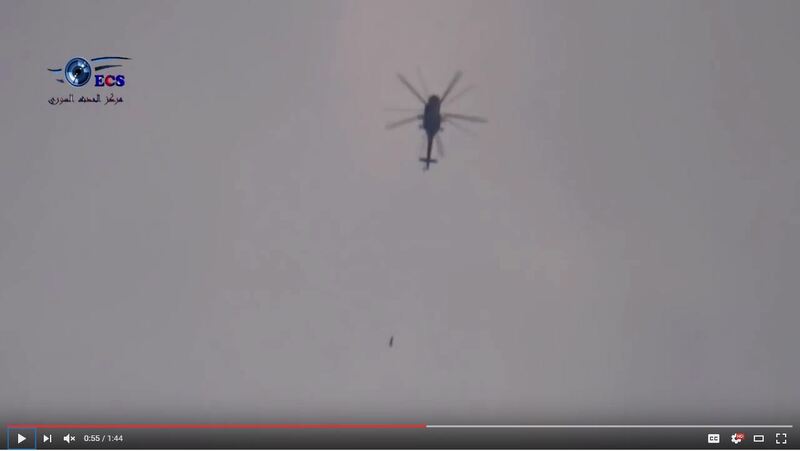 Video 2, also filmed by Mahmoud al-Hamwi, again shows a munition falling from a helicopter. The impact is obscured by a building, however a small amount of splash can be seen. The colour is difficult to determine. Video 3 was posted Syrian Event Centre, a pro-rebel outlet that posts media predominantly from Hama province. It show three different munitions being pushed out of helicopters, followed by their impacts, all displaying smoke with a distinctive yellow colour. In the first and the third impact (although not the second, as the base is obscured behind trees) the yellow smoke clearly sinks and begins to flow downhill. This effect is less pronounced after the third impact due to wind. Video 3 has clearly been edited, and there is no continuous shot of a munition falling from the helicopter and impacting on the ground. It is also evident that the 2nd and 3rd scenes showing a munition falling from the helicopter are exactly the same shot, with the helicopter in exactly the same position and the munition falling in exactly the same way, with the camera losing focus at exactly the same time. Although this may simply be an editor at the Syrian Event Centre being overly-enthusiastic, it does bring the providence of the video into doubt. This is a collage of different videos which claim to have been filmed at different location in the vicinity of Al-Lataminah, on 25th October 2016. Many show what appear to be conventional strikes on the town. However two clips, at 0:00 – 0:37 and 1:19 – 1:35, capture scenes which appear similar to the chlorine test. The first clip clearly shows a munition falling from a helicopter all the way to impact, creating a cloud that appears to remain low to the ground. However, the video cuts away to a different shot before we can examine it further. The second clip at 1:19-1:35 is much clearer and shows a splash which produces a large amount of yellow smoke which begins to sink to the ground. There is then a cut, and in the same location there is a large cloud of yellow smoke being pushed by the wind. Along with the videos of the attack, there were also reports of injuries within Al Lataminah itself, including cases of “suffocation”. The amount of media in this case is deceptive. Many of the videos depict events which either show conventional munitions, or are so obscured as to be difficult to assess accurately. However, Video 3 and sections of Video 4 certainly depict events which are consistent with the release of chlorine we saw in the test video. It is also evident that the strikes depicted in Video 3 are the same as those shown in Video 4 but filmed from a different angle, including one that follows the munition all the way from the helicopter to impact without a cut. This shows that the strikes depicted in Video 3 are genuine, despite the editing which led to questions about its authenticity. All the helicopters depicted in these videos are visually similar to the Mi-8/17 family, used extensively by the Syrian government. Without further evidence it is not possible to say whether there was only one, or multiple helicopters. Fig. 8 – Comparison of helicopters. From left: Video 1, Video 2, Video 3, Video 4, Stock photo of Mi-17 for comparison. 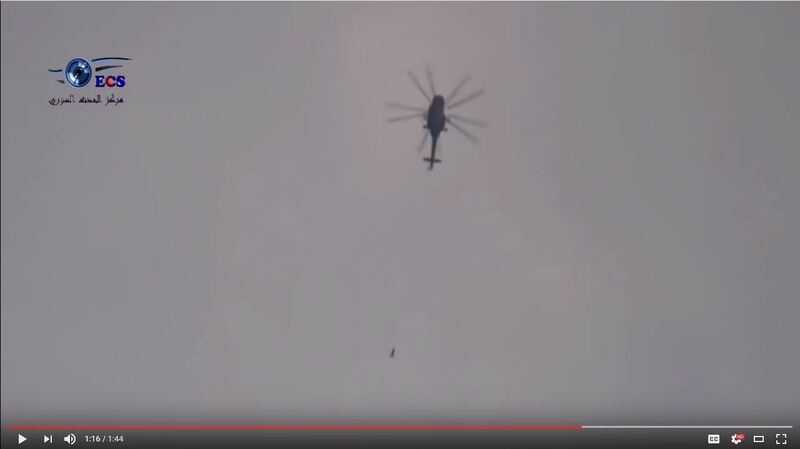 In several of the videos we can clearly see the munition falling from the helicopter. The resolution of these videos makes identification difficult: it is clear they have three large fins, suggesting they are improvised rather than standard bombs, and it is notable most chlorine barrel bombs that have been used in the past few years are based on a three tail fin design (see here for more details). We can also see that at least one of these munitions appears to have been dropped from the back of the helicopter rather than from one of its pylons, again suggesting it is an improvised munition. We geolocated Videos 3 and 4 to the north-west outskirts of Al-Lataminah. We located the position from which Video 4 was filmed, but could not accurately identify the exact location of the cameraman from Video 3. The targeting of these bombs is interesting: they do not appear to be aimed at the city of Al-Lataminah itself, but rather outside the center. Considering the inaccuracy of bombs dropped from helicopters, especially barrel bombs, it seems strange that these munitions were dropped on a large area of open ground, rather than on the city itself. If the helicopter was simply dropping conventional barrel-bombs, the city would be an adequately sized target. However, if this was indeed a chemical attack aimed at Al-Lataminah, the pilot would have taken into account wind conditions to blow the gas onto the city itself. We have seen from the videos that there was an easterly wind, which indeed pushed the gas from the area of open ground directly towards the city itself. It has been suggested that these explosions and their distinctive colour, could have been caused by the incomplete combustion of Ammonium Nitrate, which can be mixed with fuel to produce ANFO, a improvised explosive mix that was used extensively for IED’s in Afghanistan. However, this tends to produce red, rather than yellow, coloured smoke and it rises rather than sinks. The 7th December 2015 rebel tunnel bomb in Aleppo is a good example of what incomplete combustion of Ammonium Nitrate looks like. These videos show that on the 25th October 2016 helicopters, most likely from the Syrian government, dropped munitions close to the town of Al-Lataminah. Although it is not possible to positively identify a chemical attack from digital media alone, at least 3, possibly 4, of these munitions and their emissions acted in a way consistent with chlorine gas. It also comes within the same week as reports of chemical attacks in Al Rashedeen and Al-Hamdaniyah. These tactics are consistent with other attacks analysed in a report from OPCW and the UN, which identified the Syrian government as being responsible for a series of chemical attacks using barrel bombs containing chlorine dropped from helicopters.